Tesla stock is in the most trouble its ever been in, and Elon Musk's increasingly erratic behavior is just another sign of the company's coming decline. Fortunately, it's also something you can turn into profits. In the chart we'll reveal below, you can see exactly how Tesla's share price is losing momentum and the price level we expect it to plunge below. Musk was truly a visionary entrepreneur and created companies in what can only be described as the coolest of the cool. From Tesla Inc.'s (NASDAQ: TSLA) electric cars and batteries, to SolarCity's renewable clean energy, to Space-X's reusable rockets and the mission to Mars, who could not envision comic books with him as the hero? In fact, Musk's latest antics might simply be a distraction from the very serious problems Tesla stock faces right now. As smart as he is, Musk cannot keep out of the headlines, let alone stay out of trouble with the authorities. Smoking pot during an interview or defaming one of the rescuers of the boys in the cave in Thailand might make investors a little uncomfortable. But Musk's tweets have put him in legal jeopardy. The U.S. Securities and Exchange Commission was not amused with his unfounded claim that the company would go private at $420 a share, and it took action. Now Musk must have lawyer vet and approve his tweets before sending them. So far, he hasn't listened, creating a new showdown with America's securities regulator. That's some serious grief, but Money Morning Capital Wave Strategist Shah Gilani sees a few things that are more immediately troubling for the company. That was quite a hit to the company's coffers. In fact, the payout to convert the bonds was about a quarter of all the cash they had on hand. And cash flow has been a perennial problem for Tesla, especially as prices on cars have been cut twice in the past six months. But there is so much more. Sales are way down since the tax credits buyers relied on were cut in half to $3,750 in January. They'll run out completely by mid-summer, and the company already laid off thousands of workers. The fundamentals are downright scary too. The current trailing price/earnings ratio is -47.7. Income per employee is negative $20,000. It's no wonder Morgan Stanley (NYSE: MS) cut its price target from $260 to $240 on Monday. Think about that for a moment. These are price targets for a year out, and the stock closed Tuesday at $272.31. Morgan Stanley isn't alone either. 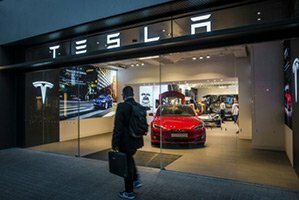 Thirty-five percent of analysts covering Tesla give it a "Sell" or "Underweight" rating. The technical indicators agree, too. The chart below shows the choppy trading we've seen over the past two years, but as it went mostly sideways, money fled en masse. The indicator at the bottom of the chart is called on-balance volume, and it measures how many shares change hands when the price is going up and when it is going down. More volume on up days suggests money flowing into the stock.